I love discovering new music. Recently I am using blip.fm a lot. I like the idea of being proposed music I would love by someone who has the same taste of music like me. For me, it is the ultimate internet use. One trouble though, is that it usually takes me at least 3-5 times to hear a song before I would know I actually like it. I have found that the best thing is to download about 10-20 songs to my cellular phone and hear them again and again for a few times. In this post I will show you how to do that quite easily using fiddler and firefox. You can also do the same to download other file types like swf movies and so on. If you are using other browser than Firefox, that’s OK, it can also work with other browsers. Fiddler is a sniffing software which I like very much. It is super easy. Please download it from here and install it. 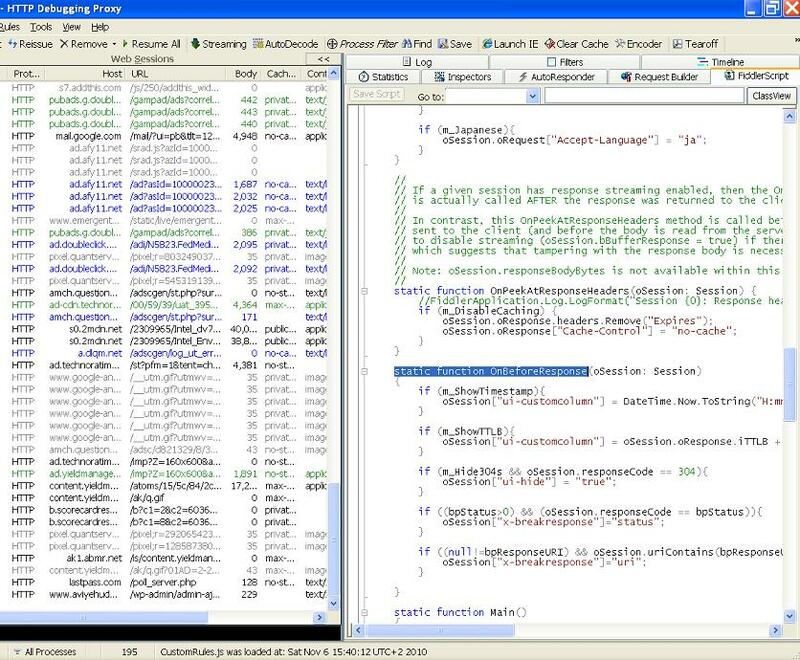 You will also have to install the script editor add-on. Please download it from here. This add on lets you do a verity of actions to your web traffic, it is really a very useful add on. Go to “FiddlerScript” tab on the top right tab bar. Go to “OnBeforeResponse” function. You can do that by choosing it from the “Go to” drop down list. Paste this snippet to the end of the function body. This script will cause the fiddler to execute firefox with the link of of each mp3 file he sniffs in the network traffic. Notice I am also appending a small parameter at the end of the file URL. I do this so the fiddler will not go into a loop and download the same file again and again. Press the “Save Script” button at the top of the script editor window. You may or may not need to do this step because your firefox is maybe already configured to download mp3 files. If it’s not or you are not sure please open up your firefox. Go to “Tools” > “options” > “Applications”. 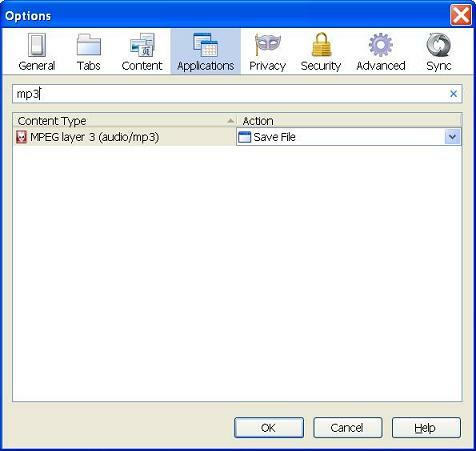 Type “mp3” in the search input field and make sure that the action for this file type is “Save File”. Press “OK” and that is it. Go to blip.fm (or any other mp3 streaming site) and start listen to mp3s. Notice that in blip.fm you can listen to swf or mp3 files. The script I have shown you above, downloads only mp3s. You van easily change it to download swf files. Notice that blip.fm gives you the ability to skip the videos and just focus on the mp3s, this is even better for our use. And that it is. While you listen to the music, for every mp3 the fiddler will sniff, it will fire up the firefox which will than start to download the mp3s to your computer automatically. Actually you don’t even have to listen to the whole song, you can just wait for a few seconds until the song starts and go right away to the next song. This entry was posted in Hacks and tagged fiddler, Firefox, Hacks, music, sniffing by Avi. Bookmark the permalink. This is very cool dude. Thanks!! i have problem in step 3. Try searching “Mpeg layer-3” instead. Next → Next post: Which client will dominate?